Travel to Kandy, the 2nd largest city of the island and the cultural capital of the nation, is a must on any tour of Sri Lanka. This great city, famed for housing the temple of the Tooth Relic of Buddha is placed centrally in the nation, making travel to Kandy a relatively easy task if not for the up-hill journey. Nestled in the centre of glorious mountain ranges and rocks, the Kandy Kingdom was a fortified stronghold, having withstood many attacks from foreign invaders. Kandy Sri Lanka is a city steeped in tradition, culture and history, yet is one of the most developed cities in the island nation. 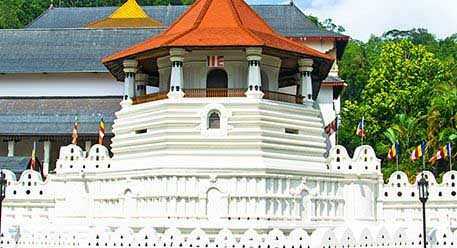 There are many structures of architectural significance that you will encounter during your visit to Kandy. The Kandy weather forecast is generally quite predictable. Cool weather is the norm, with March and May being the best months to travel to Kandy.